He also took a closer look than I did at the walls of one of the rear construction pits, and recognized that a vertical line of bricks going down about six feet indicated the presence of a privy (in the lingo of my native land: a dunny) which could possibly date back to the very first construction on the property in 1740. Privies are rich sources of archaeological artifacts, being receptacles of not only what the archaeologists sometimes adorably term "night soil," but also household trash. We resolved to return on Thursday night, after the construction workers had knocked off for the day, to see what else we might find. Long story short: HOLY NIGHT SOIL. We found so much stuff, we went back on Saturday and found some more of it. And in between, and since Saturday, I spent every waking hour (and some of the hours I should have been sleeping) obsessively washing and sorting and matching and assembling and gluing. This was such a joy! I was one of those kids whose dad was always yelling "Don't touch that!" because I wanted to feel every cool thing in the world. I've been trained well to refrain from touching objects at museums, but that hasn't meant the desire has gone away. Finally, my grabby little fingers could handle the forbidden fruit as much as they wanted, because it was mine, I found it, on my property. Also, I'm pretty good at jigsaw puzzles, but I always found them pointless. Now at last I had multiple jigsaw puzzles with a purpose. If I believed wholeheartedly in fate, it would seem very fateful that Matt and I bought this property and spearheaded this construction and were on hand to rescue these objects. Remember that time we went to Egypt and geeked out on the archaeology there (and also found some very human looking bones in the sand at Saqqara)? Or that time we went on a dinosaur dig and found an allosaurus skull? This latest chapter seems extremely right. I have learned a nightsoil-ton about mid-18th to mid-19th Century rubbish in the last few days while waiting for epoxy to set: a crash course in redware, slipware, creamware, stoneware, porcelain, and glassware, with some information on bones, pipes, and shoe leather thrown in. Here's an example of the reading I've been doing while taking breaks to use the modern equivalent of the privy. I also learned that Colonial people ate a LOTTTTTT of oysters and dumped all the shells in the toilet or used them as fill, and also that oyster shells look identical to pieces of pottery when jumbled up in a pile of 200-year-old night soil, and god I really hate oyster shells now. How old are these artifacts? This site about bottles found at Colonial Williamsburg notes that the shape of our most intact wine bottles date them to the mid- to late-1700s. (As I mentioned, the first building on the site was erected at 103 Callowhill between 1740 and 1745 around 1761.) The redware pottery would also suggest a mid- to late-1700s origin for the oldest artifacts, as it is extremely similar to pottery found in other sites around Philadelphia that date from this period; see, for example, the pottery of Henry Piercy. (N.B. We also found four pieces of "kiln furniture" - pieces of clay that are used in a kiln to stack pots and keep them steady during firing, could there have been a kiln onsite once? Or perhaps waste from a potter was used as fill at some point.) Redware became less common after the 18th century after it was discovered that lead glaze is toxic, oops. We found one piece of stoneware with a maker's mark on it: Willets Manufacturing Company, which began creating stoneware in Trenton, NJ, in the late 1800s. In a pit closer to the front of the building, we found some newer items such as glass soda bottles and Bromo-Selzer bottles that date from the 1910s, which I'm guessing is approximately when the slab foundation was poured. What information do you have about stratification? The majority of the fragments were recovered from piles of dirt that had already been extracted from the construction pits, so sadly most in situ information has been lost. Some of the more intact objects were located about 55 inches below the slab and dug out of the pit walls. What are you going to do with these artifacts? We'll display them somehow in the space, of course, probably in the lobby/cafe area. There's too much for all of it to be displayed at once, so I guess some of it will go in our apartment too. Unless someone knows of a museum who wants to borrow it so more people can see it. We're not going to sell anything because (a) it's not worth all that much money, and (b) it's much cooler to use it to showcase the history and character of the property once the theater is complete. 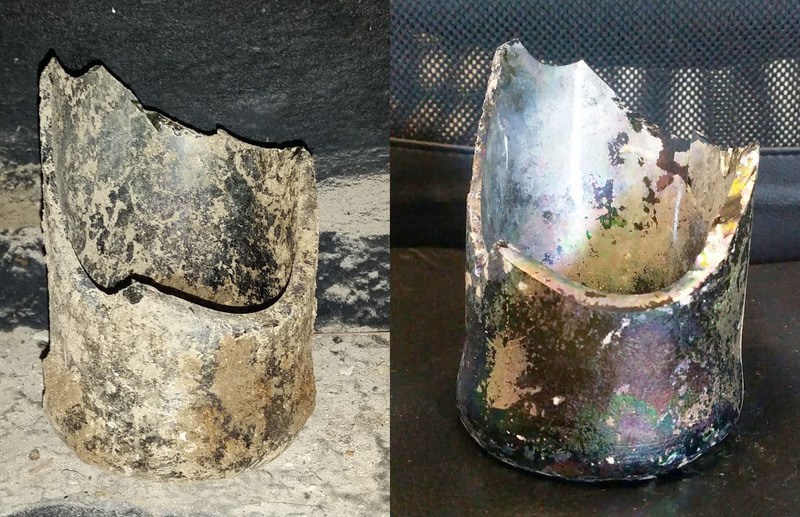 Have you been contacted by museums or archaeologists about this? Goodness me, no. 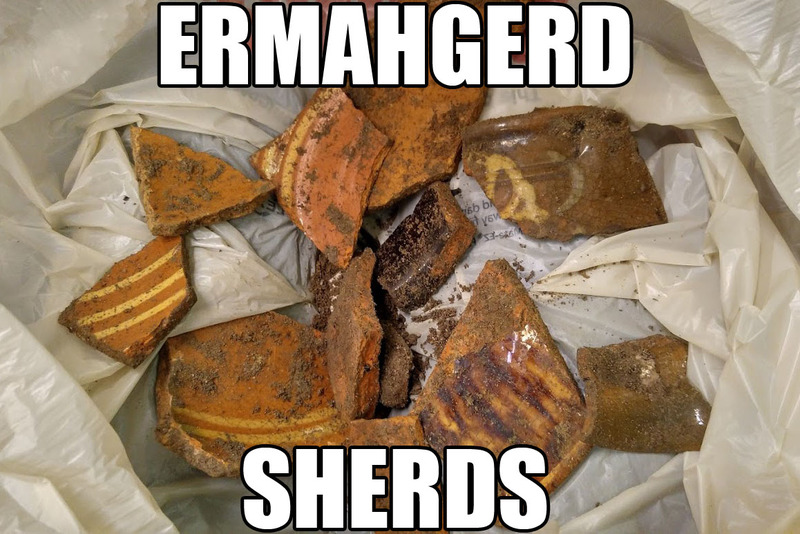 As far as archaeological finds go, this is very common stuff. Colonial privies are found all over this area (of some note is this description of a privy dig in Wilmington in 2008 which unearthed extremely similar artifacts). It's cool and exciting because it happened to us, in our theater, but there's nothing earth-shattering in these finds that hasn't been documented in similar sites hundreds of times before. Erm, yes. I will update when we feel we can give more information about that. Are you going to excavate further? Goodness me, no. We are spending an obscene amount of money that we don't have to build a theater with an apartment we can live in. We can't delay construction for any reason without the construction project costing significantly more. If we had unlimited money, I would totally bust up the slab and dig out the entire property to find more privies, but as it is, I am literally skipping meals because my belt is so tight. Erm, stay tuned. 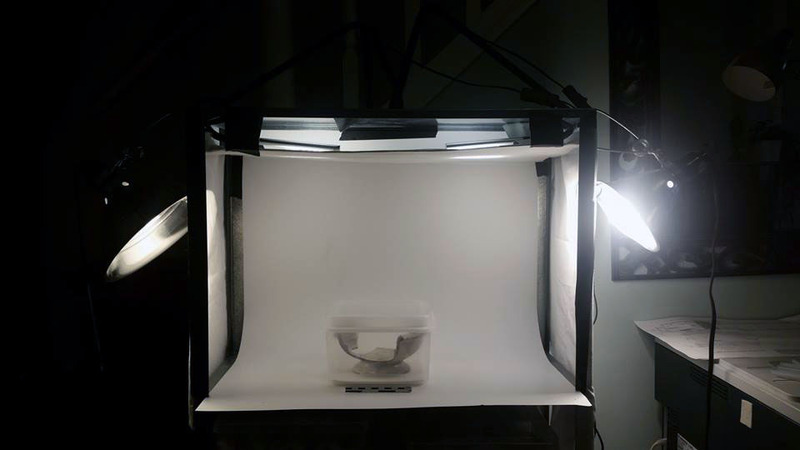 Yesterday I threw together a lightbox out of an Ikea Hyllis shelf, a few lamps I had around the house, some poster board, and some muslin cloth.